California is getting desperate enough in its historic drought to deploy the ultimate weapon: Balls. Shade balls. Shade balls are tiny plastic black spheres that are dumped en masse into reservoirs as a conservation and protection measure. As the Los Angeles Daily News reports, you need a lot of them to be effective, and L.A. has released about 96 million of them into its Van Norman reservoir. 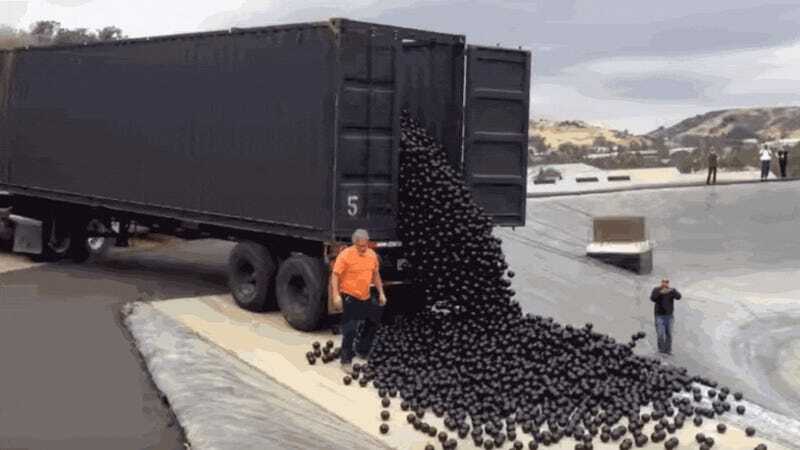 So what can a black plastic ball do to help the water supply? Quite a lot, actually. They help save water by preventing evaporation. In blocking the sun, they also prevent the chemical reaction that forms the carcinogenic compound bromate (which is not your friend, despite the name). And they form a protective ball-barrier across the surface of the water that helps keep birds, animals and other contaminants out. My favorite thing about shade balls is the method of deployment. No special methods or mechanisms required: just take a ball-filled sack down to the water, open it up, and set the balls free. This video from a shade ball deployment at a reservoir in Las Virgenes, Calif., two months ago shows what I mean. Be careful, I lost about ten minutes watching those hypnotic balls.